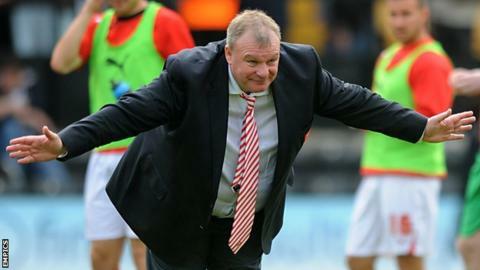 Stevenage boss Graham Westley says his Rotherham counterpart Steve Evans does not live up to his fiery billing. Scot Evans has a reputation for being vociferous on the touchline. "Steve's an alright guy. People read him as a fiery character. A lot of it's just huff and puff," Westley told BBC Three Counties Radio. "He's a guy who's willing to smile away from his football and he's got a job to do in the dugout, and he plays with that fire but he's a pussycat really." Westley's side, one point above the relegation zone, host the play-off chasing Millers on Saturday. Evans, 51, has twice won promotion from the Conference Premier with Boston and Crawley. His time with Boston was tarnished after he was given a 12-month suspended jail sentence in 2006 for tax evasion. "He's a good manager," said Westley. "He did the job in the Conference [with Boston]. "Obviously he had his problems when he won promotion from the Conference and everybody has talked a lot about that. "But he knows how to get teams winning. He's gone on to do well at Rotherham."